Jamie Dimon is mad. He's mad -- like so many Americans -- about the state of public education in many American cities. Especially in Detroit. "This is probably one of the biggest disasters, Not just Detroit. A lot of inner city schools in America," Dimon told CNNMoney in an exclusive interview in Detroit. "Americans should understand that 50%, or something like, of the kids in inner-city schools, often poor and often minority, don't graduate. And the ones that do, don't necessarily have the skills to get a job. That is the biggest disgrace in this country," Dimon lamented. "We should be ringing an alarm bell on every hilltop and every mountain top and saying this shouldn't be allowed." In a separate event for a group of entrepreneurs in Detroit, Dimon pointed out that there were more than 5 million open jobs in the U.S. right now, near a record high. With some 8 million unemployed Americans, the problem is a skills gap. Dimon argues the failure to educate America's youth with the skills needed to get these jobs is the ultimate societal failure. As CEO of JPMorgan Chase (JPM), Dimon spent the day in Detroit recently to meet with entrepreneurs and small-business owners and see the impact of a $100 million commitment his bank has made to the revival of the city. The bank on Wednesday announced an additional $4 million towards an initiative (along with the Skillman Foundation, the Ford Foundation and the Ford Motor Company Fund) to connect 10,000 Detroit high school students to career education and work experiences over the next three years. "JPMorgan was founded in Detroit...We're the biggest bank here, consumer, commercial, large corporate. So it's an important town to us," Dimon told CNNMoney. "We've watched Detroit become a train wreck for 20 years." But when Dimon met Detroit Mayor Mike Duggan following his 2014 election, he started to view the city in a different light. "This mayor is just practical, and thoughtful and not sanctimonious, and not ideological." In Duggan, Dimon saw a mayor who said: "Let's turn the lights on and get sanitation better. Let's rehab some abandoned homes. Let's get businesses back in town. We said we're all in." 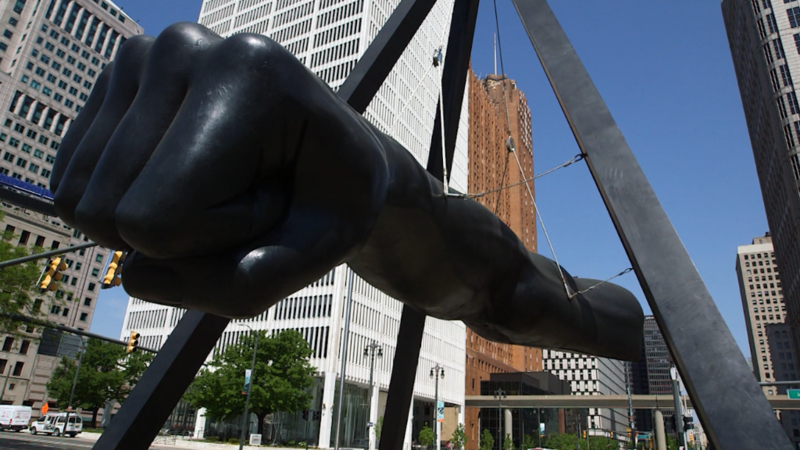 JP Morgan is two years into a $100 million investment in Detroit. The city may be on the mend, but after becoming the biggest American city ever to go bankrupt -- Detroit still has a long way to go. The Motor City is still battered and bruised. Unemployment here is about twice the national average and some 30,000 homes remain abandoned. To say the financial crisis -- and rampant foreclosures -- hit Detroit hard is an understatement. And many here still point their finger squarely at Wall Street and its biggest banks. "JP Morgan obviously made mistakes," Dimon told CNNMoney. "But to me, we were also steadfast. If you talk about JP Morgan, we were here in the darkest moments for everybody at all time. We didn't run. We didn't hide. All the big banks rolled over trillions of dollars of loans when the market place wasn't willing to. But we've made mistakes. We try to admit the mistakes. We learn from them and move on. And we've paid a heavy price for them." In Detroit, Dimon sees a city that could rise again. But he admits, that cannot happen unless Detroit's public schools thrive. The Detroit Public School district is in utter disrepair and the bankruptcy that relieved the city of $7 billion in debt missed Detroit's schools completely. The Detroit public school system was not included in the city's financial reorganization. The school district, with more than $500 million in operating debt according to the Michigan governor's office, is on track to run out of money to pay its teachers and staff by the end of June. In protest, many of the teachers have joined sick-outs closing down a majority of the district's 97 schools, sometimes for days at a time. The state-appointed emergency manager, though, assured teachers in May they will be paid for the full school year. It's not just a salary fight. Many of the school buildings in Detroit are outdated, dilapidated and physically decaying. Dimon sees the problem on a national scale. "Among those people not graduating, there might be a Steve Jobs or Barack Obama. We'll never know," he said. The National Center for Education Statistics data show low income students are five times more likely to drop out of high school than high income students. High school graduates make about $630,000 more over their lifetimes than non-high school graduates. Dimon acknowledged the immediate need is "the right curriculum, the right teachers, the right help and the right money" but in education he sees a bigger need -- paying more attention to vocational education in areas where the jobs are. "Having a community college degree, and you get out and have no job, is a sense of hopelessness," he said. "They have to work together with local businesses to make sure that what they are being taught is what the businesses need." Mayor Duggan bluntly says there is no way his city can turnaround without it. "Everything about reducing poverty is bringing in businesses and getting our young people educated and having the skills to work. If you don't do both things, we won't fundamentally change the trajectory in the city," he said in an interview with CNNMoney in Detroit. So with the schools in such disrepair -- why is JP Morgan betting $100 million on Detroit? Dimon sees this city's comeback in it's "entrepreneurial spirit" noting in a recent op-ed the 61,000 small businesses (50,000 of them minority-owned) as part and parcel to returning Detroit to a thriving metropolis. Dimon calls it the "job" -- the responsibility -- of institutions, including big business, to partner with local government to create an environment where entrepreneurs can thrive. He points to research by the JPMorgan Chase Institute which found 58% of consumer spending in Detroit happens at small businesses -- compared to an average of 36% in 14 other cities the Institute studied. Duggan is quick to point out the $100 million JPMorgan has committed to Detroit is not charity. "Business is in business to make money and I'm not under any illusion. I think JPMorgan is gonna make a lot of money off of Detroit because they're invested in the city at a time is down and they're gonna be a central part of the growth," the mayor said. "I bet Jamie Dimon would be the first to tell you he expects JPMorgan Chase to benefit significantly from Detroit's recovery." Asked if he sees Detroit as a smart investment, Dimon told CNNMoney "I hope so. If it doesn't work I'll feel far worse for the people of Detroit than I do for JPMorgan. But yes I hope it can be a little part of turning around this great city." -- Chris Isidore and Heather Long contributed to this article.